From BBC News: “While in Southmead Hospital in November 2016 Oliver [McGowan], from Bristol, was prescribed the anti-psychotic drug Olanzapine. This was despite him and his parents repeatedly telling medics he should not be given it because he had reacted badly to the drug in the past and because he did not have a mental health diagnosis. An inquest into his death in April heard the Olanzapine caused Oliver to contract the rare condition Neuroleptic Malignant Syndrome, causing his brain to swell and his eventual death. 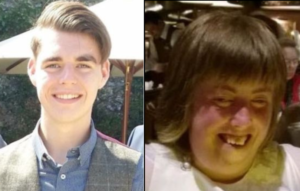 The coroner ruled the drug had been properly prescribed but since then Mrs. McGowan has been campaigning for better health care for people who have autism and learning disabilities. She said Oliver became anxious when they arrived in A&E and began repeatedly talking about gaming. Mrs. McGowan said Oliver had been sitting on the bed with about four or five people standing over him, which she said would be enough to make anyone feel anxious, and he was restrained by police officers, one of whom threw him on a bed. She believes Oliver’s behavior during his admission to hospital contributed to the decision to prescribe Olanzapine. Mrs. Richards, whose daughter [Katy Lowry] had chromosomal abnormalities and learning difficulties, said proper training was needed but she was concerned that without a change in peoples’ attitudes it would not be enough. ‘The sad thing in Katy’s case is they just took one look at her and made an assumption that that was as good as it got,’ she said. ‘Somebody with learning disabilities who is 30 – that must be it. Miss Lowry was taken to Royal Cornwall Hospital on 13 December 2016, after vomiting every 15 minutes for nearly 24 hours. While in A&E her observations – which would have shown how sick she was – were not taken and she collapsed two-and-a-half hours after being admitted. A coroner ruled her death was due to natural causes contributed to by neglect at the hospital. Mrs. Richards said: ‘I spent 30 years fighting every aspect, making sure she had a quality of life the same as everybody else and for me, when she needed it most perhaps I didn’t fight enough. Next articleWho Are They to Say I Wasn’t Buddha? Yes, but it’s okay to Kill in Mental Health, isn’t it? Some people might say NO – but I would say YES. I was shocked by this story for many reasons. You mean that medical students/doctors don’t get training on learning disabilities? Not in the however many years it takes to train a doctor? And that MPs have to debate it? And that if they do decide doctors need training it might be e-learning. In another interview Mrs McGowan expressed a hope that it would be face-to-face not e-learning. She also in another interview said how the coroner had been “ferociously protective” of the doctors who treated their son, which is something that has struck me frequently when reading the antidepaware blog. I also don’t understand how their son could have been given a drug without his consent. Southmead is a regular hospital – they had taken him to accident and emergency because he had a prolonged seizure. It doesn’t say he had been sectioned, although the doctor who administered the fatal drug was a “neuropsychatrist”.